Rain showers doused parts of northern Illinois, just days after tornadoes and severe weather ravaged the area. The rain began moving in for parts of the Chicago area during the earlier morning hours Thursday, as many braced for another round of thunderstorms and potentially heavy rainfall. While the potential for severe storms diminished by late Wednesday, the storms could pack a punch in terms of rainfall. The heavy rain brings with it flooding concerns with many local rivers already running high, particularly in far southern counties. Most of northern Illinois was under a Flash Flood Watch through Thursday afternoon, but that watch was canceled early Thursday morning for many counties. Rain moves out of the area Thursday morning but the chance for showers remains in the forecast. Kankakee, Livingston, Iroquois, Ford and Benton counties in Illinlois and Newton and Jasper counties in Indiana remained under the watch until 1 p.m. The chance for showers and storms decreases during the afternoon hours Thursday. A Severe Thunderstorm Watch for Ogle, Lee and LaSalle counties expired at 5 a.m. 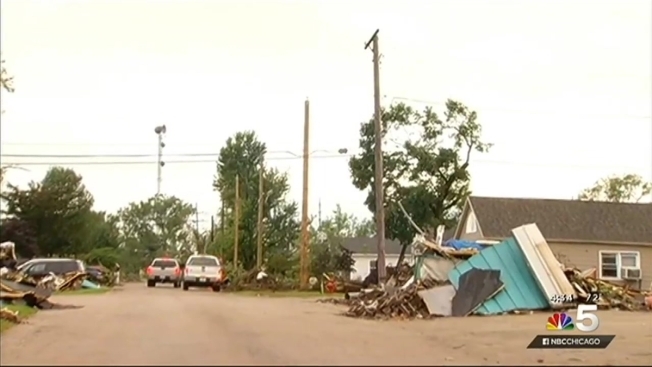 The rain comes after parts of north central Illinois saw severe storms and tornadoes, injuring at least 10 people and leaving several homes and businesses damaged. The National Weather Service on Tuesday confirmed nine tornadoes hit the area, including an EF-3 twister that was the strongest the Chicago metropolitan area had seen in nearly 25 years. Coal City Mayor Terry Halliday said he was "very concerned" about the potential for more storms in the area. "Obviously we’re hoping that that does not impact us," Halliday said Wednesday. "There’s not a lot we can do. Mother Nature’s going to go where it’s going to go. If we don’t get that weather I think we can make a lot of progress." Officials worked for several hours throughout the day Tuesday and into the overnight hours to try to clean up trees and downed power lines ahead of the next round of storms. "If [debris is] not picked up and we have a severe storm with a lot of wind it’s going to get thrown," Halliday said. Still, some say the weather won't be enough to stop the community from rebuilding. "It may slow us down a little bit," said Coal City Police Sergeant Tom Logan. "It’s just rain and a little bit of storms. It’s not going to stop us."